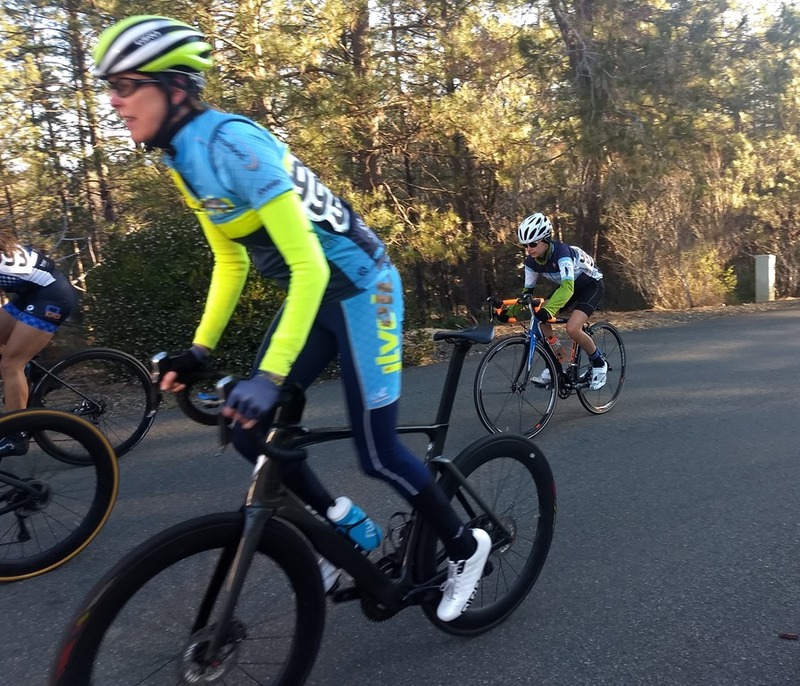 Racing: Winchester Circuit Bike Race-Anna-2019-1st Bike Race! 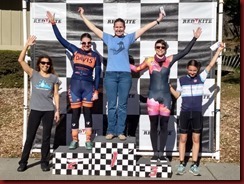 Winchester Circuit Bike Race-Anna-2019-1st Bike Race! Before the race starts, I'm getting a little nervous. Thankfully there are only adults racing so I might be able to stay up with them. There are only a few people here, it seems like some didn't show up. When the race director says go, we start to slowly head up the hill. I'm staying with the group but it feels a little difficult just from the beginning. When we get to the top of the hill and start going normal race speed, I draft behind everybody. I'm staying with them pretty well. We hit a large uphill and I try to shift into my small gear but my shifter isn't working. I fall behind the group a little bit. I finally get it to work but the group is too far away for me to catch up. I try to catch them but I'm not getting anywhere. I see a girl up ahead who is also falling behind the pack and I catch up to her and draft behind her on the down hills. I'm feeling okay because I have someone to bike with. I see my Dad and smile and keep biking. Later we get to a steep downhill. So far I've been able to go down all the downhills with no brakes. I start going down it with no brakes but there is a tight turn that is scary and I put on my brakes a little bit. When the road straightens out, then I let go of my brakes and coast all the way down. I catch back up to the girl I was biking with. She didn’t brake on that hill. We go up and down and then we hit a large uphill. About halfway up the hill, I can see the finish line for the fourth lap. Ariel and Mom are there and they cheer me on. I keep biking up the rest of the hill. I get to the top for the second lap. We go downhill and uphill and I feel great. I see a girl up ahead who is falling behind the group. I want to catch up to her. After a little bit, we finally catch up to her. 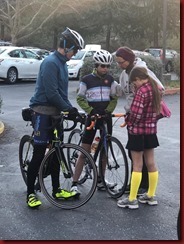 We all bike together. I see Dad as I'm going downhill. I hope he saw how well I was drafting. I am noticing how the other girl we caught up to is great at descending but not too good at climbing. We get to the steep hill and I again try not to break. When we get to the tight turn it also seems a little slanted. I break a little bit but after the turn, I let go of my brakes. I have to catch back up to the girls because I lost some speed from breaking. I easily catch back up. 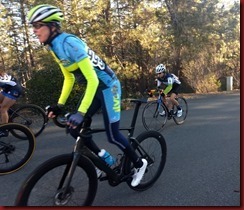 We go up and down and then get to the steep uphill to the finish line for the 4th lap. We passed the finish line and I see Ariel & Mom cheering me on. At the top of the hill we just catch up to a girl and she starts to take off. Since she is such a great descender, she gets away quickly and is soon ahead. I try to speed up to get close to her but cannot. My first partner ends up catching me later. It was almost as if I went hard for nothing. I keep biking with her trying to see if there's any way I can gain more distance on the hills. We got to the steep hill and I try not to break again. But when we came to the turn, I break. After awhile we get to a steep hill before the finishing hill and I start to pull away. I want to catch up to the girl ahead. 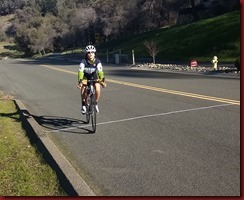 I push really hard on the hill and am able to catch up to her before the big finishing hill. I bike past the finish line and see Ariel and Mommy cheering me on. It is the last lap. 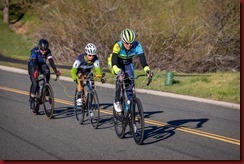 As soon as I got to the top of the hill, I try to pull away from the girl that is a good descender but she catches up to me. This time I don’t let her get away and I draft off her. I stay with her as much as I can on the downhills and stay with her on the uphills. 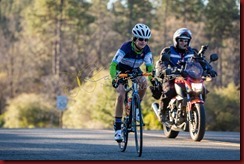 I try to not to pedal as much as she did on the downhills to save energy for the last bit. I am pretty sure I can get her at the end because she is not a strong climber. When I get to the super steep hill I really didn’t want to break at all. On the way down I don't break! Even so the girl still gains distance ahead of me. I am not worried though because if I can catch her before then I can catch her again. I pedal hard and catch back up. We hit the hill before the finish and I start to pick it up. She tells me to go and finish strong. I push it up the hill and then get a little break on a downhill. I hit the finish pushing really hard. I finish and can't wait to lie down! Praise The Lord For He Is Good, His Love Endures Forever.